One of the aspects of the Android (s goog) OS that phone owners appreciate is the high level of customization that’s possible. Just about every aspect of phone operation can be tailored to fit the user’s desires, and the interface can be changed at whim. Android phone owners who’ve taken the step to root the phone can take that even further. ResToggle is an app for rooted Android phones running Froyo (Android 2.2), that provides the ability to change the display to higher resolutions than originally supported. Why would you want to set the resolution higher? Just like on a desktop computer, changing the display to a higher resolution makes everything on the screen smaller, which means you can display more on a screen at one time. This can be advantageous on a phone with a small screen. ResToggle provides two methods to change the screen resolution: a radio button scheme that toggles between standard and hi-res settings, and a custom box that allows setting any resolution with a numeric setting. I have tried both methods, and caution the use of the custom method, as you might create a problem with an invalid value. I find the hi-res setting to be adequate for my needs, although I’ve tested a custom value of 160 (standard=240, hi-res=200), which makes things pretty darn small. It ran fine; I just couldn’t read things that small. Once the resolution is selected in the settings screen, the phone can be rebooted immediately by hitting a button. The reboot is required to enable the new screen resolution. While I’ve experienced no problems using ResToggle, any time you fiddle with system settings, there’s a possibility your particular phone won’t behave properly. In the event this happens, your phone won’t reboot normally, but the developer has you covered. 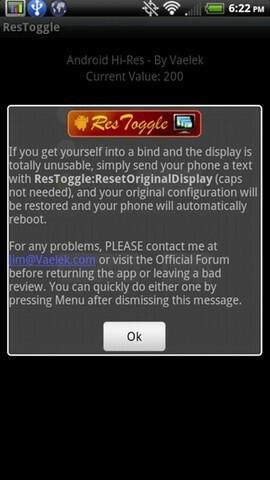 If your phone cannot boot after changing the setting with ResToggle, simply send your phone a text message with the phrase “ResToggle:ResetOriginalDisplay” (caps not needed) and your phone will automatically reset to normal and reboot. The ability to slightly increase the display resolution is wonderful, even on the large screen of my EVO 4G, as displaying slightly more at once is very useful. Take a look at the comparison screen shots I took on the EVO to see how different applications benefit from the additional resolution. Note that some apps may have trouble at a higher resolution, but most I’ve tried work just fine. ResToggle is only $0.99 in the Android Market, and the developer supports it on his website. The app works fine on my EVO 4G, and should work on any phone running Froyo, but some have reported difficulty getting it to work. This is not modifying the resolution. It’s changing the reported density of the screen. For applications developed using density independent pixels, this will make everything smaller and lower resolution. Text will be harder to read and icons will be uglier. Layouts may be uglier as well. This effectively tells Android I have the same resolution screen, but I have a much bigger screen. The obvious problems with the HTC sense clock are enough to steer me away from this app. Otherwise, I think having extra space would be useful — most notably in the notification bar where there are simply way too many (unnecessary) icons and not enough space. This is actually the Fancy Widget, not the HTC clock. Assuming that the phone always runs at the native resolution of the LCD / AMOLED display, what’s actually going on here? Does the software just change the dots-per-inch reported by the OS to other apps? I don’t know how it’s happening, but the apparent resolution of the display is very good and pleasant to the eyes.